“The Architecture of Future Mankind: How People and Technology are Shaping Cities”. Cityvision panel discussion at Woodbury University San Diego. “Latest Work” Lecture at the Public Lecture Series Architecture Faculty of the Academy of Art University San Francisco, USA. “Emergent Design Methodologies” Lecture at the Aalto University, School of Arts, Design and Architecture Helsinki, Finland. “Inspiration” lecture at the ZA Conference – Zilele Arhitecturii Crossing Borders in Cluj Napoca, Romania. “Inspiration” Lecture at Morgan State University, Baltimore, MD, USA. “Shaping Holistic Design Visions in Architecture” Lecture at the Architecture Faculty of the Academy of Art University San Francisco. “From Initial Design Idea to Final Construction“ Lecture at the Architecture Faculty of the School of the Art Institute of Chicago (SAIC). “Holistic Architectural Design Concepts in Research and Teaching” Lecture at the University of Illinois at Urbana Champaign. “Holistic Design Concepts in Research and Teaching” Lecture at the Cologne Institute of Architectural Design (CIAD) – Cologne School of Architecture, Germany. “Holistic Design Concepts in Research and Teaching” Lecture at the TU Munich, Faculty of Architecture. “Why Design” lecture at Rhein-Main School of Architecture, Wiesbaden, Germany. “Inspiration“ lecture at University of Houston, Gerald D. Hines College of Architecture summer lecture series 2012 Houston, TX USA. “Inspiration“ lecture at Georgia Tech, College of Architecture summer lecture series 2012 Atlanta, GA USA. “Fresh, Rapid and Miraculous …“ lecture as a part of the summer lecture series at the University of applied Science Dortmund. “Inspiration, Virtuosität und andere Gepflogenheiten“ (“Inspiration, Virtuosity and Other Nasty Habits“) Lecture at the Haus der Gegenwart (“contemporary house“) Munich as part of the munichstudio UCLA design-studio of Prof. Peter Ebner. “Inspiration, Virtuosität und andere Gepflogenheiten“ (“Inspiration, Virtuosity and Other Nasty Habits“) Lecture at the Hochschule Detmold. “architecture of sustainability in an experience economy“ SchücoArena Bielefeld international congress “OWL meets USA“ from June 14th – 17th. “Inspiration, Virtuosität und andere Gepflogenheiten“ (“Inspiration, Virtuosity and Other Nasty Habits“) lecture at Bochum School of Architecture, Germany. Different lectures on advanced architectural design and conceptual architecture for Master and Diploma students. „Buildings and Projects“ Lecture at the Haus der Gegenwart (“contemporary house“) Munich as part of the munichstudio UCLA design-studio of Prof. Peter Ebner. “Inspiration, Virtuosität und andere Gepflogenheiten“ (“Inspiration, Virtuosity and Other Nasty Habits“) lecture at the University of Wuppertal, Germany. “conceptual design and representation” appointment lecture at the Technical University Munich, Germany. “ction – form follows fun…” lecture at the University of Houston College of Architecture, TX, USA. “ction – form follows fun…” lecture at the University of Denver College of Architecture, Denver CO, USA. “ction – form follows fun…” lecture at the University of Colorado at Boulder, College of Architecture, CO, USA. 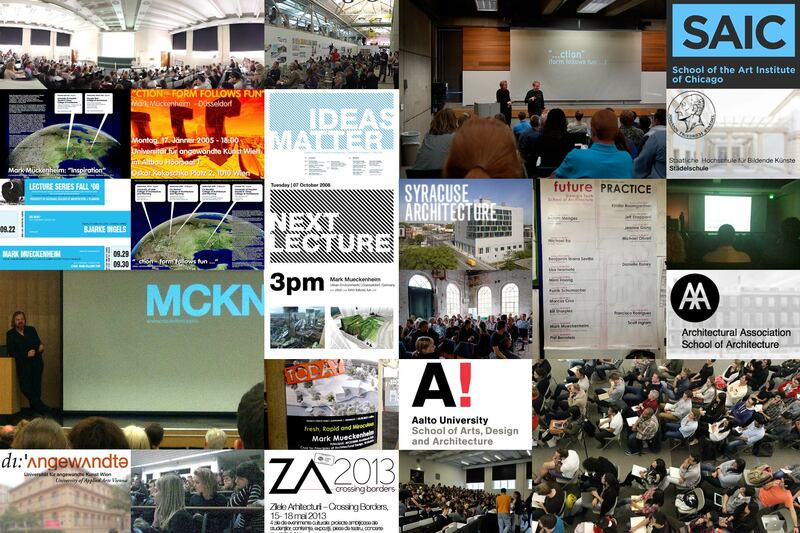 “ction – form follows fun…” lecture at the University of Utah, College of Architecture, Salt Lake City, UT, USA. “Recent Projects” lecture at the Academy for International Education, Düsseldorf – exchange program with Texas A&M University. “ction – form follows fun…” lecture at the South Bank University – School of Architecture, London. “urban farming concepts” lecture at the Architectural Association, London. “Recent Projects” lecture at the class of Prof. Michael Pelken, Syracuse University, Syracuse, New York, USA. “conceptual representation and architectural design“ lecture at the Frankfurt School of Architecture, Frankfurt a.M., Germany. “conceptual architectural design“ Technical University Munich, School of Architecture. “Recent Projects” lecture at the Academy for International Education Düsseldorf, exchange program with Texas A&M University. “_ction – form follows fun” lecture at the Academy for International Education, Düsseldorf, exchange program with Texas A&M University. “_ction – form follows fun” lecture at the Academy of Arts at Städel, Frankfurt a.M., Germany. “_ction – form follows fun” lecture at the University of Arts Vienna (die Angewandte), Austria. “_ction – form follows fun” lecture at the Academy of Art University San Francisco, USA. “Concept and Context II” lecture for the introduction to architectural design for first and second semester students at the RWTH Aachen, Germany. “there is no spoon – digital concepts in architecture” lecture at the Summer Academy of the German Werkbund. Theory seminar at Castle Gnadenthal, Kleve, Germany. “Concept and Context I” lecture for the introduction to architectural design for first- and second-semester students RWTH Aachen, Germany. “Project Report” lecture at the RWTH Aachen. “Digital representation in architectural design” lecture at the Bergische University Wuppertal, Germany. “Digital tools in architectural design” lecture at the Bergische University Wuppertal, Germany.